The following is extracted from the USP Compendia of Standards and is for information purposes only. For actual method development and operation of dissolution testers, please refer to the latest USP documentation directly. This general chapter is harmonized with the corresponding texts of the European Pharmacopoeia and/or the Japanese Pharmacopoeia. The texts of these pharmacopeias are therefore interchangeable, and the methods of the European Pharmacopoeia or the Japanese Pharmacopoeia may be used for demonstration of compliance instead of the present general chapter. These pharmacopeias have undertaken not to make any unilateral change to this harmonized chapter. Portions of the present general chapter text that are national USP text, and therefore not part of the harmonized text, are marked with symbols (♦ ♦) to specify this fact. This test is provided to determine compliance with the dissolution requirements ♦ where stated in the individual monograph ♦ for dosage forms administered orally. In this general chapter, a dosage unit is defined as 1 tablet or 1 capsule or the amount specified. ♦ Of the types of apparatus described herein, use the one specified in the individual monograph. Where the label states that an article is enteric-coated, and where a dissolution or disintegration test that does not specifically state that it is to be applied to delayed-release articles is included in the individual monograph, the procedure and interpretation given for Delayed-Release Dosage Forms is applied unless otherwise specified in the individual monograph. For hard or soft gelatin capsules and gelatin-coated tablets that do not conform to the Dissolution specification, repeat the test as follows. Where water or a medium with a pH of less than 6.8 is specified as the Medium in the individual monograph, the same Medium specified may be used with the addition of purified pepsin that results in an activity of 750,000 Units or less per 1000 mL. For media with a pH of 6.8 or greater, pancreatin can be added to produce not more than 1750 USP Units of protease activity per 1000 mL. The assembly consists of the following: a vessel, which may be covered, made of glass or other inert, transparent material¹ ; a motor; a metallic drive shaft; and a cylindrical basket. The vessel is partially immersed in a suitable water bath of any convenient size or heated by a suitable device such as a heating jacket. The water bath or heating device permits holding the temperature inside the vessel at 37 ± 0.5 during the test and keeping the bath fluid in constant, smooth motion. No part of the assembly, including the environment in which the assembly is placed, contributes significant motion, agitation, or vibration beyond that due to the smoothly rotating stirring element. An apparatus that permits observation of the specimen and stirring element during the test is preferable. The vessel is cylindrical, with a hemispherical bottom and ♦ with one of the following dimensions and capacities: for a nominal ♦ capacity of 1 L, the height is 160 mm to 210 mm and its inside diameter is 98 mm to 106 mm; ♦ for a nominal capacity of 2 L, the height is 280 mm to 300 mm and its inside diameter is 98 mm to 106 mm; and for a nominal capacity of 4 L, the height is 280 mm to 300 mm and its inside diameter is 145 mm to 155 mm. ♦ Its sides are flanged at the top. 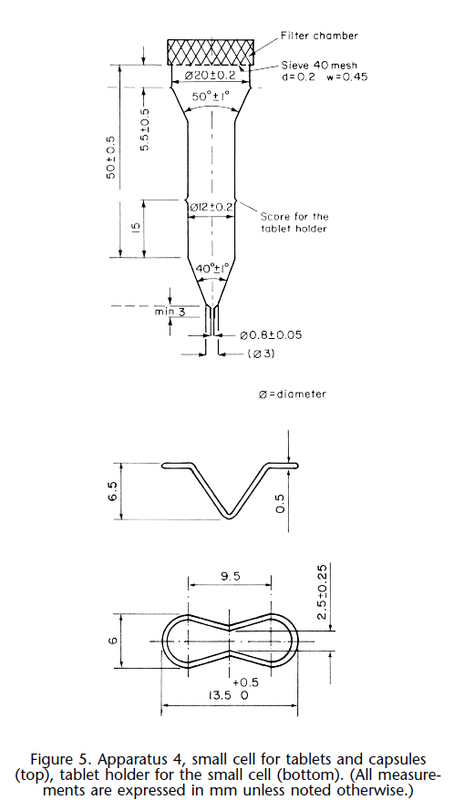 A fitted cover may be used to retard evaporation.² The shaft is positioned so that its axis is not more than 2 mm at any point from the vertical axis of the vessel and rotates smoothly and without significant wobble that could affect the results. A speed-regulating device is used that allows the shaft rotation speed to be selected and maintained at the specified rate ♦ given in the individual monograph, ♦ within ±4%. 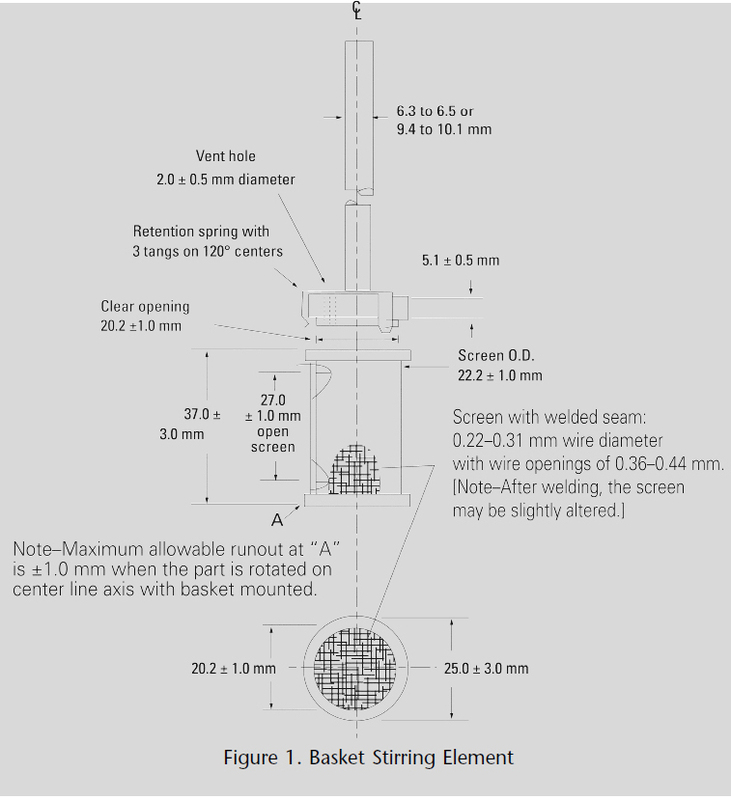 Shaft and basket components of the stirring element are fabricated of stainless steel, type 316, or other inert material, to the specifications shown in Figure 1. A basket having a gold coating of about 0.0001 inch (2.5 µm) thick may be used. A dosage unit is placed in a dry basket at the beginning of each test. The distance between the inside bottom of the vessel and the bottom of the basket is maintained at 25 ± 2 mm during the test. Use the assembly from Apparatus 1, except that a paddle formed from a blade and a shaft is used as the stirring element. The shaft is positioned so that its axis is not more than 2 mm from the vertical axis of the vessel at any point and rotates smoothly without significant wobble that could affect the results. The vertical center line of the blade passes through the axis of the shaft so that the bottom of the blade is flush with the bottom of the shaft. The paddle conforms to the specifications shown in Figure 2. The distance of 25 ± 2 mm between the bottom of the blade and the inside bottom of the vessel is maintained during the test. The metallic or suitably inert, rigid blade and shaft comprise a single entity. A suitable two-part detachable design may be used provided the assembly remains firmly engaged during the test. The paddle blade and shaft may be coated with a suitable coating so as to make them inert. The dosage unit is allowed to sink to the bottom of the vessel before rotation of the blade is started. A small, loose piece of nonreactive material, such as not more than a few turns of wire helix, may be attached to dosage units that would otherwise float. An alternative sinker device is shown in Figure 2a. Other validated sinker devices may be used. 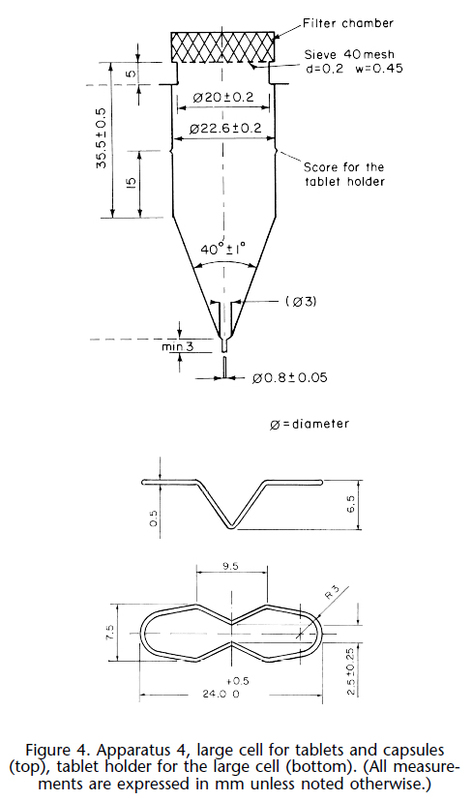 he assembly consists of a set of cylindrical, flat-bottomed glass vessels; a set of glass reciprocating cylinders; inert fittings (stainless steel type 316 or other suitable material), and screens that are made of suitable nonsorbing and nonreactive material and that are designed to fit the tops and bottoms of the reciprocating cylinders; and a motor and drive assembly to reciprocate the cylinders vertically inside the vessels and, if desired, index the reciprocating cylinders horizontally to a different row of vessels. The vessels are partially immersed in a suitable water bath of any convenient size that permits holding the temperature at 37 ± 0.5 during the test. No part of the assembly, including the environment in which the assembly is placed, contributes significant motion, agitation, or vibration beyond that due to the smooth, vertically reciprocating cylinder. A device is used that allows the reciprocation rate to be selected and maintained at the specified dip rate ♦given in the individual monograph♦ within ±5%. An apparatus that permits observation of the specimens and reciprocating cylinders is preferable. The vessels are provided with an evaporation cap that remains in place for the duration of the test. 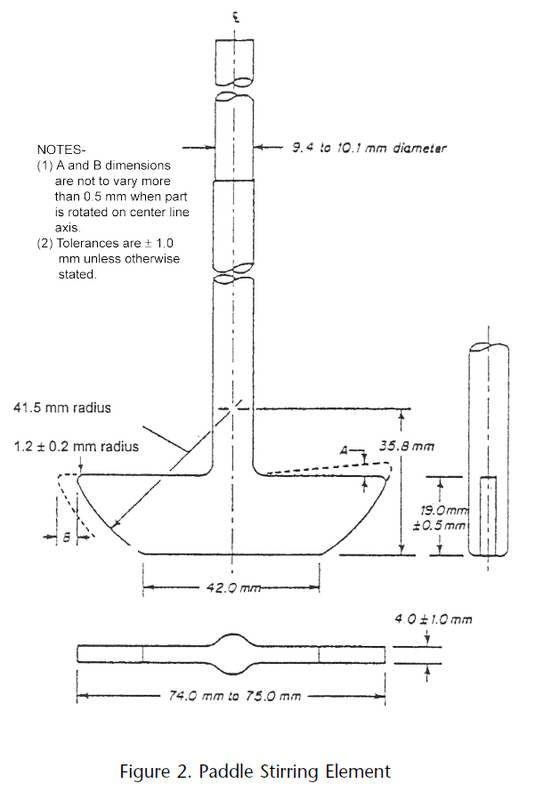 The components conform to the dimensions shown in Figure 3 unless otherwise specified ♦in the individual monograph♦. The assembly consists of a reservoir and a pump for the Dissolution Medium; a flow-through cell; and a water bath that maintains the Dissolution Medium at 37 ± 0.5. Use the specified cell size ♦as given in the individual monograph♦. The pump forces the Dissolution Medium upwards through the flow-through cell. The pump has a delivery range between 240 and 960 mL per hour, with standard flow rates of 4, 8, and 16 mL per minute. It must deliver a constant flow (±5% of the nominal flow rate); the flow profile is sinusoidal with a pulsation of 120 ± 10 pulses per minute. 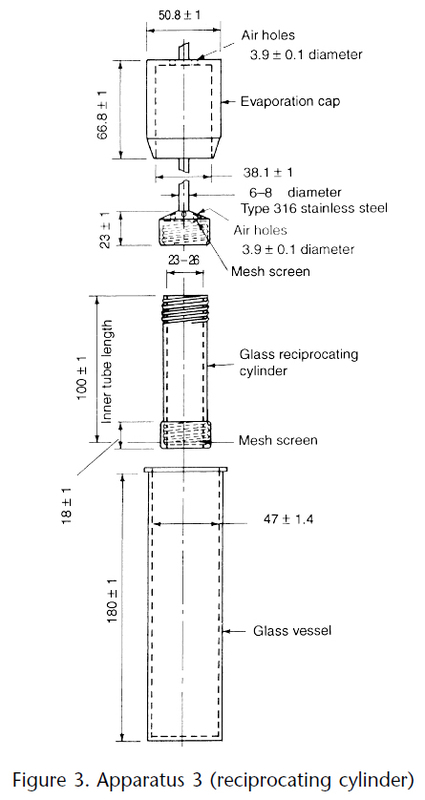 The flow-through cell (see Figures 4 and 5), of transparent and inert material, is mounted vertically with a filter system (specified in the individual monograph) that prevents escape of undissolved particles from the top of the cell; standard cell diameters are 12 and 22.6 mm; the bottom cone is usually filled with small glass beads of about 1-mm diameter with one bead of about 5 mm positioned at the apex to protect the fluid entry tube; and a tablet holder (see Figures 4 and 5) is available for positioning of special dosage forms, for example, inlay tablets. The cell is immersed in a water bath, and the temperature is maintained at 37 ± 0.5. The apparatus uses a clamp mechanism and two O-rings to assemble the cell. The pump is separated from the dissolution unit in order to shield the latter against any vibrations originating from the pump. The position of the pump should not be on a level higher than the reservoir flasks. Tube connections are as short as possible. Use suitably inert tubing, such as polytef, with about 1.6-mm inner diameter and chemically inert flanged-end connections. The determination of suitability of a test assembly to perform dissolution testing must include conformance to the dimensions and tolerances of the apparatus as given above. In addition, critical test parameters that have to be monitored periodically during use include volume and temperature of the Dissolution Medium, rotation speed (Apparatus 1 and Apparatus 2), dip rate (Apparatus 3), and flow rate of medium (Apparatus 4). Determine the acceptable performance of the dissolution test assembly periodically.♦The suitability for the individual apparatus is demonstrated by the Apparatus Suitability Test. Apparatus Suitability Test, Apparatus 1 and 2— Individually test 1 tablet of the USP Dissolution Calibrator, Disintegrating Type and 1 tablet of USP Dissolution Calibrator, Nondisintegrating Type, according to the operating conditions specified. The apparatus is suitable if the results obtained are within the acceptable range stated in the certificate for that calibrator in the apparatus tested. Apparatus Suitability Test, Apparatus 3— Individually test 1 tablet of the USP Drug Release Tablets (Single Unit) according to the operating conditions specified. The apparatus is suitable if the results obtained are within the acceptable range stated in the certificate. Place the stated volume of the Dissolution Medium (±1%) in the vessel of the specified apparatus ♦given in the individual monograph,♦ assemble the apparatus, equilibrate the Dissolution Medium to 37 ± 0.5, and remove the thermometer. Place 1 dosage unit in the apparatus, taking care to exclude air bubbles from the surface of the dosage unit, and immediately operate the apparatus at the specified rate ♦given in the individual monograph♦. Within the time interval specified, or at each of the times stated, withdraw a specimen from a zone midway between the surface of the Dissolution Medium and the top of the rotating basket or blade, not less than 1 cm from the vessel wall. [NOTE—Where multiple sampling times are specified, replace the aliquots withdrawn for analysis with equal volumes of fresh Dissolution Medium at 37 or, where it can be shown that replacement of the medium is not necessary, correct for the volume change in the calculation. Keep the vessel covered for the duration of the test, and verify the temperature of the mixture under test at suitable times.] Perform the analysis ♦as directed in the individual monograph♦ using a suitable assay method.³ Repeat the test with additional dosage form units. If automated equipment is used for sampling or the apparatus is otherwise modified, verification that the modified apparatus will produce results equivalent to those obtained with the standard apparatus described in this general chapter is necessary. Time— Where a single time specification is given, the test may be concluded in a shorter period if the requirement for minimum amount dissolved is met. Specimens are to be withdrawn only at the stated times within a tolerance of ±2%. Proceed as directed for Immediate-Release Dosage Forms. Dissolution Medium— Proceed as directed for Immediate-Release Dosage Forms. Time— The test-time points, generally three, are expressed in hours. Use Method A or Method B and the apparatus specified ♦in the individual monograph.♦ All test times stated are to be observed within a tolerance of ±2%, unless otherwise specified. Method A— Procedure ♦(unless otherwise directed in the individual monograph)♦— ACID STAGE— Place 750 mL of 0.1 N hydrochloric acid in the vessel, and assemble the apparatus. Allow the medium to equilibrate to a temperature of 37 ± 0.5. Place 1 dosage unit in the apparatus, cover the vessel, and operate the apparatus at the specified rate ♦given in the monograph♦. After 2 hours of operation in 0.1 N hydrochloric acid, withdraw an aliquot of the fluid, and proceed immediately as directed under Buffer Stage. Method B— Procedure ♦(unless otherwise directed in the individual monograph)♦— ACID STAGE— Place 1000 mL of 0.1 N hydrochloric acid in the vessel, and assemble the apparatus. Allow the medium to equilibrate to a temperature of 37 ± 0.5. Place 1 dosage unit in the apparatus, cover the vessel, and operate the apparatus at the rate specified ♦in the monograph♦. After 2 hours of operation in 0.1 N hydrochloric acid, withdraw an aliquot of the fluid, and proceed immediately as directed under Buffer Stage. Perform an analysis of the aliquot using a suitable assay method. ♦The procedure is specified in the individual monograph♦. Place the stated volume of the Dissolution Medium in each vessel of the apparatus, assemble the apparatus, equilibrate the Dissolution Medium to 37 ± 0.5, and remove the thermometer. Place 1 dosage-form unit in each of the six reciprocating cylinders, taking care to exclude air bubbles from the surface of each dosage unit, and immediately operate the apparatus as specified ♦in the individual monograph♦. During the upward and downward stroke, the reciprocating cylinder moves through a total distance of 9.9 to 10.1 cm. Within the time interval specified, or at each of the times stated, raise the reciprocating cylinders and withdraw a portion of the solution under test from a zone midway between the surface of the Dissolution Medium and the bottom of each vessel. Perform the analysis as directed ♦in the individual monograph♦. If necessary, repeat the test with additional dosage-form units. Dissolution Medium —Proceed as directed for Immediate-Release Dosage Forms under Apparatus 1 and Apparatus 2. Time —Proceed as directed for Immediate-Release Dosage Forms under Apparatus 1 and Apparatus 2. Proceed as directed for Immediate-Release Dosage Forms under Apparatus 3. Dissolution Medium —Proceed as directed for Extended-Release Dosage Forms under Apparatus 1 and Apparatus 2. Time —Proceed as directed for Extended-Release Dosage Forms under Apparatus 1 and Apparatus 2. Proceed as described for Delayed-Release Dosage Forms, Method B under Apparatus 1 and Apparatus 2 using one row of vessels for the acid stage media and the following row of vessels for the buffer stage media and using the volume of medium specified (usually 300 mL). ce the glass beads into the cell specified ♦in the monograph♦. Place 1 dosage unit on top of the beads or, if specified ♦in the monograph,♦ on a wire carrier. Assemble the filter head, and fix the parts together by means of a suitable clamping device. Introduce by the pump the Dissolution Medium warmed to 37 ± 0.5 through the bottom of the cell to obtain the flow rate specified ♦in the individual monograph♦ and measured with an accuracy of 5%. Collect the eluate by fractions at each of the times stated. Perform the analysis as directed ♦in the individual monograph♦. Repeat the test with additional dosage-form units. Proceed as directed for Immediate-Release Dosage Forms under Apparatus 4. Dissolution Medium —Proceed as directed for Immediate-Release Dosage Forms under Apparatus 4. Time —Proceed as directed for Immediate-Release Dosage Forms under Apparatus 4. Proceed as directed for Delayed-Release Dosage Forms under Apparatus 1 and Apparatus 2, using the specified media. Time —Proceed as directed for Delayed-Release Dosage Forms under Apparatus 1 and Apparatus 2. Unless otherwise specified ♦in the individual monograph♦, the requirements are met if the quantities of active ingredient dissolved from the dosage units tested conform to Acceptance Table 1. Continue testing through the three stages unless the results conform at either S1 or S2. The quantity, Q, is the amount of dissolved active ingredient ♦specified in the individual monograph,♦expressed as a percentage of the labeled content of the dosage unit; the 5%, 15%, and 25% values in Acceptance Table 1 are percentages of the labeled content so that these values and Q are in the same terms. ♦Immediate-Release Dosage Forms Pooled Sample— Unless otherwise specified in the individual monograph, the requirements are met if the quantities of active ingredient dissolved from the pooled sample conform to the accompanying Acceptance Table for a Pooled Sample. Continue testing through the three stages unless the results conform at either S1 or S2. The quantity, Q, is the amount of dissolved active ingredient specified in the individual monograph, expressed as a percentage of the labeled content. Unless otherwise specified ♦in the individual monograph♦, the requirements are met if the quantities of active ingredient dissolved from the dosage units tested conform to Acceptance Table 2. 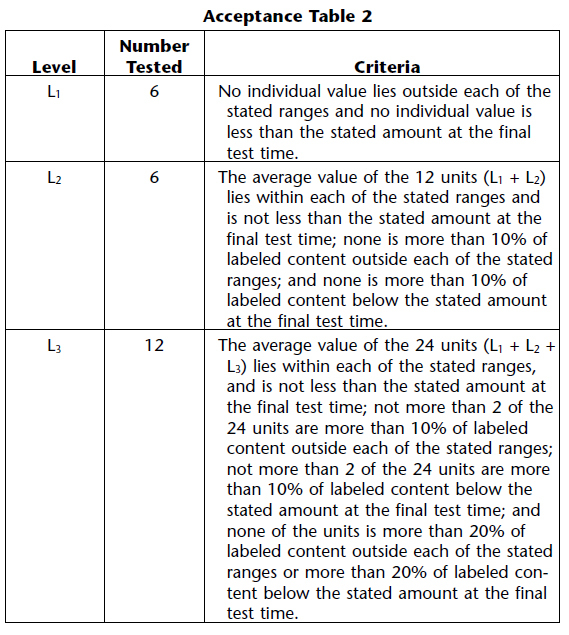 Continue testing through the three levels unless the results conform at either L1 or L2. Limits on the amounts of active ingredient dissolved are expressed in terms of the percentage of labeled content. The limits embrace each value of Qi, the amount dissolved at each specified fractional dosing interval. Where more than one range is specified ♦in the individual monograph♦, the acceptance criteria apply individually to each range. NOT ACCEPTED BY THE JAPANESE PHARMACOPOEIA. Acid Stage— Unless otherwise specified ♦in the individual monograph♦, the requirements of this portion of the test are met if the quantities, based on the percentage of the labelled content, of active ingredient dissolved from the units tested conform to Acceptance Table 3. Continue testing through all levels unless the results of both acid and buffer stages conform at an earlier level. Buffer Stage— Unless otherwise specified ♦in the individual monograph♦, the requirements are met if the quantities of active ingredient dissolved from the units tested conform to Acceptance Table 4. Continue testing through the three levels unless the results of both stages conform at an earlier level. The value of Q in Acceptance Table 4 is 75% dissolved unless otherwise specified ♦in the individual monograph♦. The quantity, Q,♦specified in the individual monograph♦ is the total amount of active ingredient dissolved in both the Acid and Buffer Stages, expressed as a percentage of the labeled content. 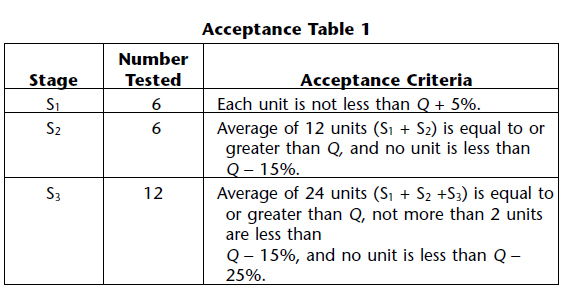 The 5%, 15%, and 25% values in Acceptance Table 4 are percentages of the labeled content so that these values and Q are in the same terms. 1 The materials should not sorb, react, or interfere with the specimen being tested. 2 If a cover is used, it provides sufficient openings to allow ready insertion of the thermometer and withdrawal of specimens. 3 Test specimens are filtered immediately upon sampling unless filtration is demonstrated to be unnecessary. Use an inert filter that does not cause adsorption of the active ingredient or contain extractable substances that would interfere with the analysis. 4 One method of deaeration is as follows: Heat the medium, while stirring gently, to about 41, immediately filter under vacuum using a filter having a porosity of 0.45 µm or less, with vigorous stirring, and continue stirring under vacuum for about 5 minutes. Other validated deaeration techniques for removal of dissolved gases may be used.